Do you really need to seal your tile? Yes! It might seem like an extra unnecessary step in your home maintenance, but tile sealing is very important. Your tile is probably a large part of your home and in multiple rooms, such as your flooring, kitchen counters, shower walls, and more. Because it’s such an important part of your home, you want to make sure that your tile looks good and is healthy. Tile sealing is an important part of caring for your tile. You might not even know what tile sealing is. That’s okay! Tile sealant is a protective layer that is applied to the surface of your tile. Your tile and grout are very porous, so that means that water, germs and more able to soak into your tile. Wet tile is the perfect breeding ground for mold. If your grout is black or brown, that’s likely mold. Gross! A tile sealant will keep your tile clean and safe from mold and bacteria. It will also make it easier to clean up any spills on your tile before they become stains. Are There Negative Effects to Not Sealing Tile? It might seem like sealing tile is just important to keep your grout clean-looking and fresh. However, it goes deeper than that. Not sealing your tile can be harmful to you and your family’s health. That’s because your tile is often in the wettest rooms of your house, such as the bathroom, These are the rooms that are most prone to mold growth. Mold can grow in the porous surface of your tile and can spread throughout your home and into your air. Breathing in mold can cause health problems. It’s important to stop mold at the source and seal your tile. Why Do I Need More Tile Sealant? 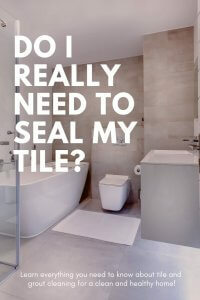 Yes, many tiles are sealed when they are installed in your home. However, that sealant wears out over time. If you don’t believe me, pour a little bit of water on your tile. Does it stay bubbled on the surface, or start to sink into your tile? If water can be absorbed into your tile, so can anything else. Sealant wears out and needs to be reapplied every year. Can I Use Just Any Tile Sealant? There are tile sealants that you can buy and apply yourself. However, not every tile sealant is created equal. Some tile sealants will wear down faster than others. And, not all tile is the same. Different types of tile and grout have different needs. Using the wrong type of tile sealant may mean that it’s not effective, or it may even discolor or damage your tile. The best thing to do is to call a tile cleaning professional to assess your tile and apply the right type of tile sealant for your home. What Else Do I Need to Know About Tile Sealant? One thing that is important to know about tile sealant is that not only are you sealing out everything, you are also dealing in anything that may already be in or on your tile. That’s why it’s so important to make sure that your tile is clean before you seal it. This is where a professional comes in handy again. A professional tile cleaner can get your tiles nice and clean so you won’t be sealing in any mold or other bacteria and making your tile worse. There you have it, everything that you need to know about tile sealant. If you’re looking for a good tile cleaning and sealing in the San Francisco area, North American Chem-Dry is happy to help. Schedule your appointment today!